Combine the tomatillos, avocado, onion, cilantro, chile (you can add half of the chile first, and add more if you want more heat…) and salt in a blender or food processor. Puree until smooth. Besides the carnitas whay other dishes do you enjoy with this sauce? I’ve made this and your carnitas at least 100 times in the last few years. I love your recipes. Thank you for sharing! Would it be OK to use yellow onion? I recommend using a white onion…but you can substitute with a yellow onion. If I make a big batch, can I freeze or can it for future use? Thank you, your Salsa Verde with Avocado is fantastic. My family pours it over almost everything. My family does too! Thank you for trying it! I have made your Salsa Verde and your carnitas twice and both times they were GREAT! Thank you for bringing authentic Mexican cuisine to the home cook. It is my pleasure, Gloria! Every time I make tomatillo salsa it comes out sour. When I get the salsa from our “local” tamale supplier it is not sour, help and don’t say sugar, please. Hola Todd, It could be the tomatillos! When you buy tomatillos, pick ones that are firm with a shiny, deep green color. They shouldn’t be wrinkled or squishy. You may need to peek under their husks at the store. Also, give them a really good wash in cold water before making the salsa. Salsa Verde Cruda con Aguacate- Que rica!!! This is perfect served with triangle wedges of warm, fresh homemade (claro que si!) corn tortillas. Gracias! Pati, I absolutely love your show. I am going to make this for my family tonight. My wife calls you my new girl friend because when your program comes on, I make everyone be quite so I don’t miss anything. Do you have an episode of making flour tortillas? I used to watch my grandfather make them as a child, but it was never passed down to any of us kids. I would love to learn how to make them homemade like he did. Thanks. I will be sure to include how to make flour tortillas on my next season. Stay tuned and thank you so much for watching! Pati, I made the Carnitas and Salas Verde for dinner. My family LOVED them. Will definitely be making these again! May God Bless you and your Family! I loved your Carnitas and salsa. I was just in San Diego and there are many places to get good Carnitas but in Denver it’s just not the same. So I made yours and have that taken care of. I did use more meat so I added so Vegetable broth to it. Worked great! I then removed the fat from the broth and added chile Molido pura and let it cook down. So now I have two kinds of toppings. Red and green. THE BEST TACOS EVER!!! if at all possible you could please post the basic Mexican Pantry Essentials it would be greatly appreciated!! Thank”s for everything. All the recipes we have made out of your cookbook or show’s have been absolutely AWESOME!!!!! Thank you Margot, Mexican Pantry Essentials is a great idea for a post…. I’ve been experimenting with tomatillo salsas forever trying to find the right combination of ingredients a d flavors. I made this today to serve with grilled skirt steak. It’s perfect! And so simple. Thanks for sharing! Yay! Thank you for trying it!! absolutely LOVE your show and watch you every week! We have made your chicken inga many,many times and it is amazing! We are going to be making your carnitas and salsa Verde tomorrow night! Looks yummy! I made both the carnitas and the salsa verde. Better then on TV!! The recipe far exceeded my expectations. Who knew I could cook Mexican 😀 Thanks Pati! Hi Pati i am making your carnitas for the first time for my mexican husband who loves carnitas we are having them for breakfast with the queso fresco n limes n avacados n pickled jalepenos… yummt! Ty for this recipe it is more healthy then the lard cooked carnitas! I love your show! Keep it up your authentic recipes are fantastic! What a fabulous breakfast that will be! 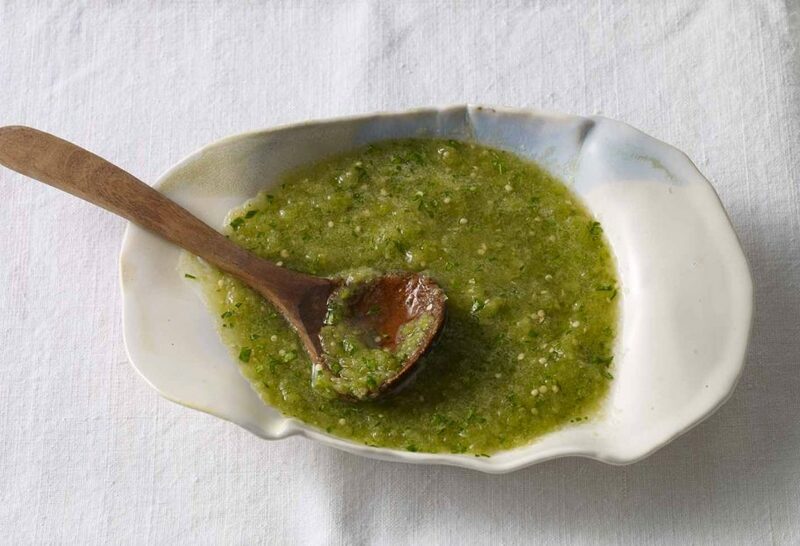 We can’t get enough of this salsa verde! My husband can even do it. Between your videos & recipes he’s been able to make several of your wonderful recipes. I hope you can post even more videos this season. It makes such a difference to those lacking in experience. It is very easy to find fresh tomatillos in our small town in Oregon they’ve become a new favorite ingredient! So glad I saw your show one day when I was home from work. I am spreading the word. I just watched you make this recipe on TV. You added cheese but it is not listed on the recipe on this site. Can you tell me what cheese it was? I agree! Fresh tomatillos are the best. becuase it came out saltly. I made it with canned tomatillo and I forgot to rinse them. I did’t put any salt in it. It does taste good but too salty for my taste. How do I fix it?